As Ghana moves forward with a US military agreement, one group seeks to challenge the country’s political direction. Image from Hardi Yakubu’s Facebook profile. In an unsurprising move, the NDC — the official parliamentary opposition — and some of its youth affiliates, called for immediate protests. Taking to the streets NDC sympathizers told journalists they worried that a base would bring about more violence than peace. NDC leaders, on the other hand, admitted they weren’t against cooperation, just against the terms of the agreement. They were largely accused of political opportunism. Nevertheless, the protests were heated. A leading opposition official was arrested and charged with treason and Ghanaian police beat and fractured the skull of a journalist covering an anti-base protest. Nana’s speech disappointed many who believe he left more questions than answers about the military agreement on the table. However, amidst the hurling of accusations between political leaders, another group stood out: the Economic Fighters League, also known as the Fighters. In contrast to the NDC — a creation of former President Jerry Rawlings — the Fighters pull inspiration from further back: they are a self-described Nkrumahist, grassroots social movement that are notably non-partisan. Despite their relatively small size, they are loud and seek new political possibilities in Ghana, beyond old partisan divisions and the NGO-ized restrictions placed on civil society. The Fighters were founded by a group of young people who originally met via the Convention People’s Party (CPP), the political party founded by Kwame Nkrumah. But in 2016, Ernesto Yeboah, Commander-in-Chief of the Economic Fighters League, Hardi Yakubu, Fighter-General, and other colleagues became disillusioned with the CPP. “In 2016, we took the then President [John] Mahama to the anti-corruption body, [the] Commission on Human Rights and Administrative Justice, to be investigated when he accepted a gift from a Burkinabé contractor,” Ernesto explained. At the time, he was the CPP’s National Youth Organizer. “We faced massive backlash from the party.” He was later suspended by the CPP for his criticisms of Mahama. In Ghana’s highly partisan political and social landscape, it makes sense that the Fighters emphasize their non-partisan stance. They are not associated with the CPP nor the Economic Freedom Fighters of South Africa (though they support them): “We are an independent organization brought forth by the circumstances of our time,” Ernesto explained. The Fighters believe that the NDC and NPP have equally facilitated what they describe as a neo-colonialist state. Characteristic of neo-colonial states is the existence of two main puppet parties who serve the same master. The NDC was voted out for pursuing IMF policies, … [genetically modified organisms], facilitating the sale of [Electricity Company of Ghana] under the [Millennium Challenge Account]. The National Patriotic Party [the current government] is pursuing same. We began with the premise that everything boils down to economics or livelihood… Under neo-colonialism, economic freedom is the ultimate, because the system triumphs on the poverty and deprivation of the masses. Selfish politicians only have to give people meager amounts of money to get them to vote for them. They then use the power to serve their own interest and that of their neocolonialist masters. If the people are economically free and empowered, this cannot happen. Right now, the Fighters are focusing on building a strong base and undertaking programming that lives out their values. 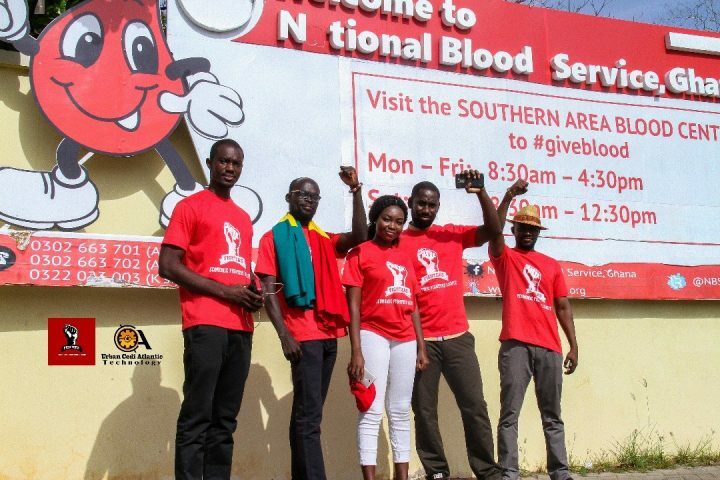 Regina, who runs programs for the Fighters, explained that they’re organizing a blood drive at Korle Bu hospital on April 21 after reports that the hospital — facing a blood shortage — was turning away pregnant women. After the mudslides in Sierra Leone, the Fighters partnered with the Ghanaian Red Cross Society to send cash, clothes and other supplies to Freetown. They have recently released GDP growth figures saying the economy grew by 8.5% in 2017… Go behind the figures and you will see that much of that came from oil, mining and other extractives. These sectors are owned and controlled by foreigners. So the growth is meaningless to citizens of Ghana. This only happens in a neocolonial state. And it is our mission to crush it.